Olive Silverlock’s mother is insane. Once a Gotham super-villain , Sybil Silverlock aka Calamity now resides in Gotham’s Arkham Asylum, in a coma. Put there by Batman. As Bruce Wayne, he provides a scholarship to Olive to attend prestigious Gotham Academy. She is greatful to Bruce Wayne. She is resentful of the Batman... as a matter of fact, she hates him. 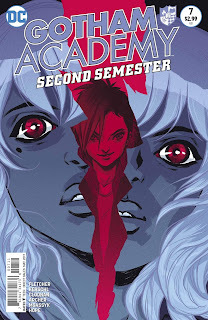 Alone at the school before the second semester begins, Olive finds herself with a new roommate, the rebellious and brash Amy who shows up in her room one day over the winter break. Amy always hasn’t been the best influence on Olive. Breaking into and vandalizing the old Wedgewood Mansion and seriously jeopardizing fellow student, Eric Jorgenson’s health by snatching his bookbag away and along with it, his inhaler…and that’s just on her first day! She’s been pretty negative about Olive’s other friends, drawing her away from them and the Detective Club she is a part of, seemingly to monopolize all her time. 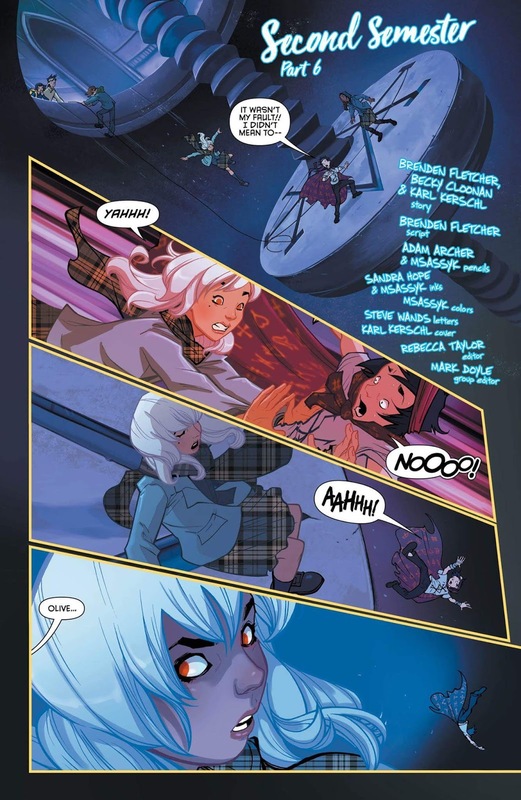 Amy doesn’t seem to like much about life at Gotham Academy and always has something negative to chirp in Olive’s ear. It’s a good thing her other friends are there for her. 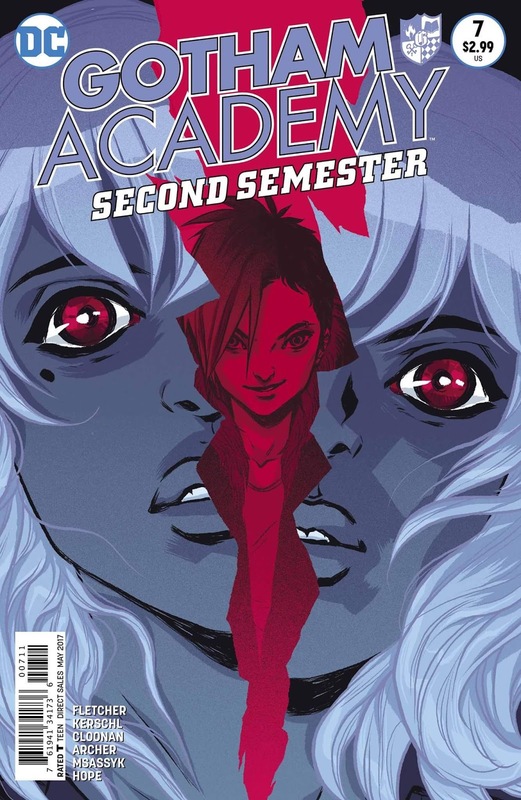 The Detective Club resumes it’s adventures as the school’s second semester begins. 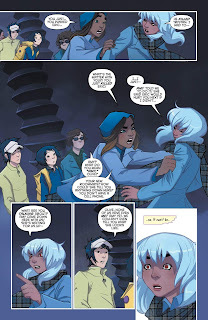 Members, students and Olive’s friends, “Maps” Mizoguchi, Pomeline Fritch, Colton Rivera and Kyle Mizoguchi have all returned and are feeling the pull of Amy on Olive. 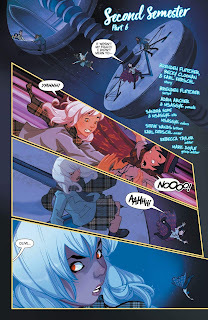 They continue their investigations however, helping to take down a revenge bent, mind controlling witch, helping out a near expelled friend and all the while, exploring the big mystery of Gotham Academy and it’s connection with the Arkhams. Strange symbols, secret passages and cryptic writings are uncovered. Clues are followed the mystery of Cobblepots, Arkhams and lost books deepen. The Club’s search has led them to a mysterious round room beneath an empty sarcophagus. Issue #7 picks up from 6 as the secret floor continues to descend. Tristan Grey, who has been infected with the Langstrom Virus, causing him to become a half-bat creature has been pushed over the side by Eric, now calling himself the Symbolist. 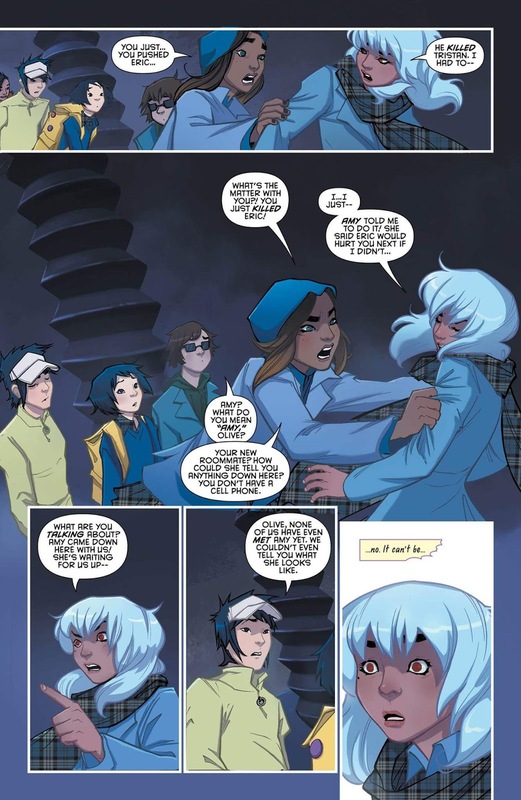 Olive, whose pyrokinesis has been slowly developing over several issues is egged on by Amy to burn Eric alive. What follows next has her friends stunned and Olive left to question her own sanity. Is she following her mother’s footsteps? Is she going mad? 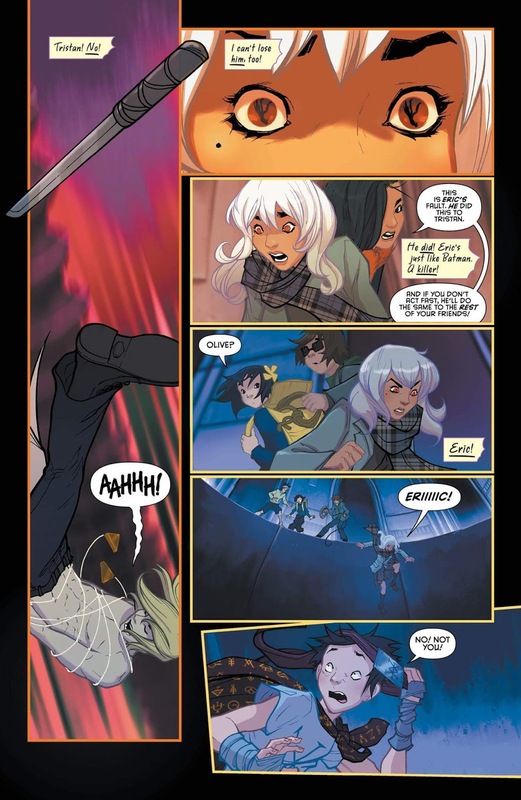 In the meantime, Pomeline and Colton finally find what she has been looking for, The Old Book of Gotham, deep below the school and uncover the most shocking information yet! Olive, confused and distraught seeks out the only person she trusts on campus, Professor Macpherson for guidance and comfort. Instead, she finds the Professor with the Batman. How could she? Why is she with HIM? Batman may only be on the last page of this issue but something tells me, he’s going to be in the next one a lot.